The VW I.D. 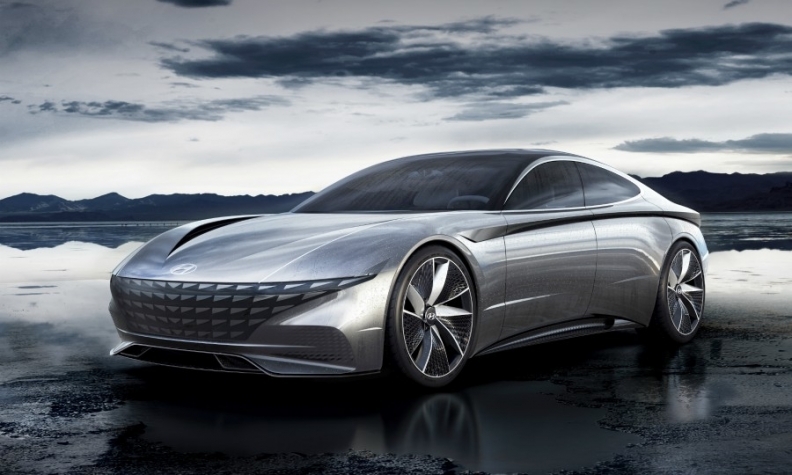 Vizzion electric sedan concept (shown) was one of the sleek sedans at the Geneva auto show that is expected to challenge the Tesla Model S.
The strangest trend at this year's Geneva auto show was the large number of sedans that appeared as concepts and production models. This was strange because in Europe the sedan body style has been losing customers for years to SUVs and crossovers. Sedan sales dipped 7 percent last year to 669,393, resulting in a market share of just 4 percent, according to figures from JATO Dynamics. Despite the steady decline, sedan concept debuts at Geneva included the BMW Concept M8 Gran Coupe, Hyundai Le Fil Rouge, Aston Martin Lagonda Vision, Volkswagen I.D. Vizzion, Pininfarina’s HK GT and the Sibylla from Hall of Fame designer Giorgetto Giugiaro’s new company, GFG Style. Production sedan debuts included the Audi A6, Peugeot 508 and Mercedes-Benz AMG GT. BMW's Concept M8 Gran Coupe previews the sedan version of the forthcoming 8-series coupe. New sedans at Geneva even outnumbered new SUVs, despite the gulf in sales. Last year, SUV sales grew 19 percent to 4.56 million units, giving the sector a 29 percent share of the European market, but the body style was poorly represented at the show. SUV launches were limited to Hyundai's Santa Fe and electric Kona, the BMW X4, Range Rover SV Coupe and Jaguar I-Pace. The Skoda Vision X was the only new concept SUV from a volume manufacturer. The first thing to note is that, with the exception of the A6, these were no ordinary three-box sedans. They were mainly described as sporty four-door coupes. Even the Peugeot 508 had what PSA described as a fastback shape. For automakers wanting to make a splash with a new concept, these low-slung, elegant cars make an impact. "The SUV now occupies a near mainstream position, so the four-door coupe has an opportunity to 'own' some of the more exclusive, slightly exotic flavor that the SUV has lost," said Sam Livingstone, director of Car Design Research. "In terms of people engagement, the SUV is not the cool thing anymore." 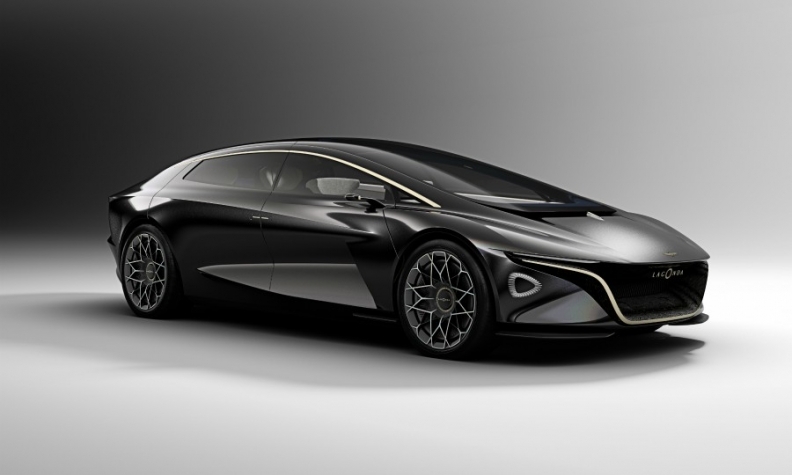 Aston Martin's Lagonda Vision Concept previews the styling planned for the revived Lagonda brand. Many of the sedan concepts – for example, the I.D. Vizzion, Lagonda Vision and HK GT -- have full-electric powertrains, which is not a coincidence, former Ford design boss J Mays said. "I would call that the Tesla effect," he told Automotive News Europe. "On the technology side, automakers are scrambling after Tesla. But, also, if you look at Tesla's sedans they are very coupe-like in their proportions." Mays, who now works as a design consultant, said that two-door and four-door coupes are still the favored shape for car stylists to express their ideas. "I was talking to [former VW, Daimler and Ford designer] Freeman Thomas about this the other day. Designers love to draw coupes," Mays said. As evidence, he pointed to his part-time teaching job at the Royal College of Art in London. 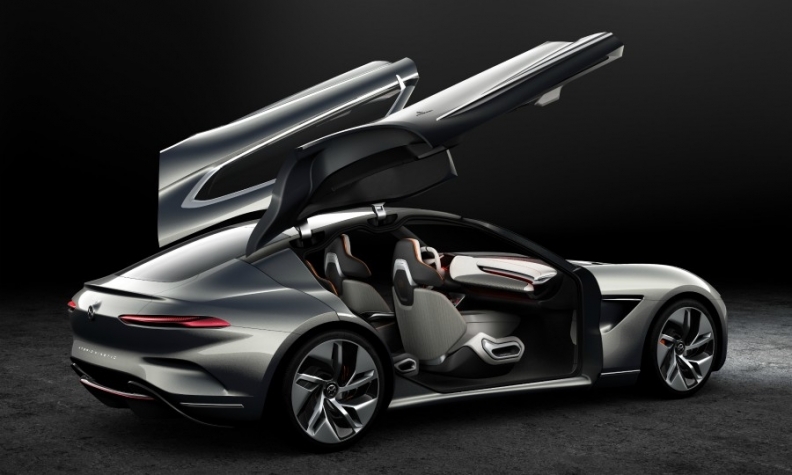 "You would think there would be a new generation of students wanting to draw autonomous vehicles, SUVs, or any number of different configurations, but they all want to draw coupes," he added. Hyundai said the Le Fil Rouge introduces the brand's new “sensual sportiness” design theme. 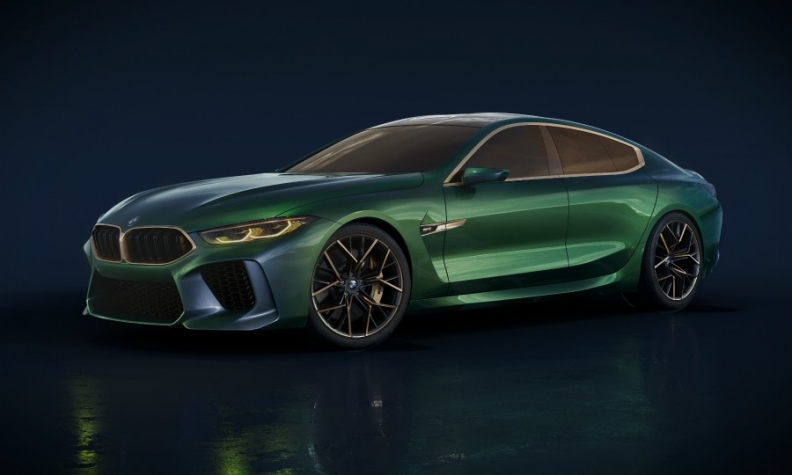 Some of the four-door coupe concepts at Geneva were created to illustrate a new design language, for example Hyundai's Le Fil Rouge, Mazda's Vision Coupe (first seen at the Tokyo auto show last year) and BMW's M8, which also previews next year's sedan version of the forthcoming 8-series coupe. BMW head of design Adrian van Hooydonk described the M8 as a four-door sports car for a more sophisticated wealthy customer. "We wanted to create something that they don't already have. It's not something they need, but something they want. To do that you have to create something exotic, something that doesn't exist. A four-door sports car," he told Automotive News Europe. Hyundai said the Le Fil Rouge introduces the "sensual sportiness" design theme that will be key to the automaker's future design language. Meanwhile, Mazda said the four-door Vision Coupe previews the next phase of its Kodo-Soul of Motion design philosophy. Mays praised the Mazda concept's sleek design. "It's a complex shape but extremely simple in execution. It easily looked like the most modern car in the show," he said. Mays was less complimentary about the Lagonda Vision, which Aston Martin said heralded Lagonda's rebirth as an all-electric luxury brand. "It was a forgettable concept," he said. Pininfarina created the HK GT plug-in coupe for Hong Kong-based Hybrid Kinetic Group. Geneva might have been full of seductive sedans, but industry watchers do not expect the body style to have a big comeback in Europe. "Despite the presentation of those concepts, I don't see any real evidence of a revival of the sedan body type," JATO global analyst Felipe Munoz said. Instead, the show's sedan concepts are expected to have more of an impact outside of Europe. The I.D. 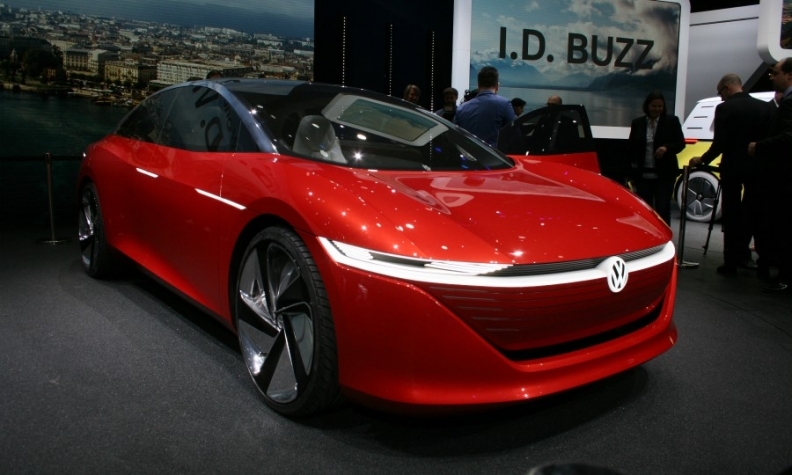 Vizzion previewed an electric sedan that will indirectly replace the Phaeton large sedan worldwide when it arrives in 2022, VW said. Sedans are still big business in countries such as China, where the body style accounted for 32 percent of sales last year, according to JATO. "The profit margin from D-segment [midsize] mainstream sedans is one of the biggest in the world," Peugeot CEO Jean-Philippe Imparato told Automotive News Europe when discussing the new 508. "Europe is important, but my strategy is to be successful outside Europe. The new 508 fits my international strategy." Peugeot design chief Gilles Vidal added that the fastback shape of the 508 was crucial to creating a more dynamic look. As Geneva proved, the sedan will always have a place despite its current unpopularity in Europe. "It's hard to conceive of a landscape without the sedan," Car Design Research's Livingstone said. "It's the original car shape."